Last updated 3/12/2013 by David Giblin. Publication: Prodr. 6: 50. 1838. Notes: FNA19: "Matricaria discoidea has been used as a medicinal and aromatic plant by Native American tribes (D. E. Moerman 1998). 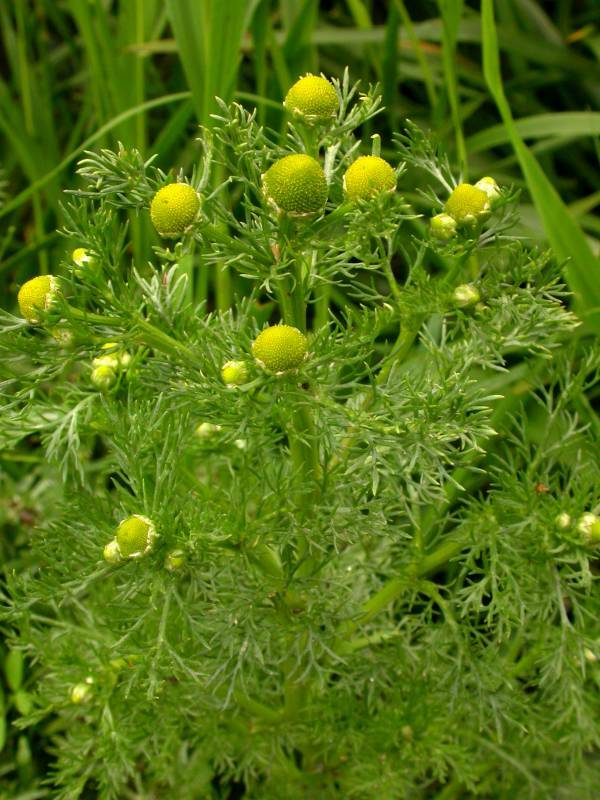 It also is considered a weed, and it is resistant to a photosystem II inhibitor herbicide in the United Kingdom (www.weedscience.org). It is a northwestern North American native that has spread to eastern and northern North America and elsewhere (E. McClintock 1993b; E. G. Voss 1972–1996, vol. 3; A. Cronquist 1994). NatureServe (www.natureserve.org) and Natural Resources Conservation Service (plants.usda.gov) erroneously present M. discoidea as introduced on the continent. Its natural habitat is ill-defined because the species has become ruderal even in its native range. For discussion of the nomenclature of this taxon, see S. Rauschert (1974); K. N. Gandhi and R. D. Thomas (1991); Cronquist; and Voss. Matricaria matricarioides (Lessing) Porter cannot be applied to the American taxon; M. matricarioides was originally published as Artemisia matricarioides Lessing, a new name for Tanacetum pauciflorum Richardson (see S. Rauschert 1974), itself a synonym of T. huronense Nuttall. W. Greuter (pers. comm. ), who accepts M. discodea, considers Rauschert's treating Artemisia matricarioides as homotypic with T. pauciflorum as equivalent to a lectotype designation."